Short Synopsis of the Story: A little elephant called Babar grew up under the care of his mother in a big forest. One day, some cruel hunters killed Babar’s mother before his very eyes. In a wild panic, Babar fled and ran and ran until he came upon a large town. Once in the town, he met an Old Lady who was kind enough to be Babar’s benefactress. Babar went to a large clothing store and bought himself fine clothes. With the help of a learned professor, Babar received a good education and together, he and the Old Lady spent a happy few years in polite, civilized, social circles in the big city. Despite the comfort and security in his town life, Babar missed his life in the forest. One day, Babar came upon two of his cousins, Celeste and Arthur, who had mischievously escaped from the forest. He spent a few happy days with his cousins, showing them about town and his way of life. When Celeste and Arthur’s mothers come from the forest and find their children it is time to go back. Babar decided that he would go back to the forest with his cousins. Despite feeling sad at leaving the Old Lady, Babar was ready to embrace his old life. When Babar, Celeste and Hector, arrived back in the forest they found that the King of the Elephants had suddenly died from eating a poisonous mushroom. All the elephants proposed that Babar should be their King. Babar accepted their proposal on the grounds that they accept Celeste as their queen. There was a grand marriage ceremony with much celebration and enjoyment and all the animals of the forest attended it. King Babar and Queen Celeste leave on their honeymoon on a big hot-air balloon, eager for new adventures. Notes: This is a wonderful story with a subtle moral. Babar returns to his old life in the forest, thus relinquishing his life of comfort in the big town. His experiences in the city, placate him in the elephant society and he is deemed worthy of being their King. Babar and his Queen, seek further adventures. Adventure and experience, bring worldliness and hence wisdom. Apart from having a lovely storyline that will capture the imagination of little children, the illustrations by de Brunhoff are exceptional. Particularly those of Babar dressed in his fine clothes, partaking of amusements that are popular in genteel society. This is deemed to be one of the first graphic novels of it’s kind and de Brunhoff is often referred to as being the father of the contemporary picture book. I did find the references to Babar’s mother being killed a little shocking though and my three year old daughter was clearly affected by the incident and kept asking about it. Perhaps, death is a fact that needs to be dealt with, however, young we may be. It is a point that I am still pondering. 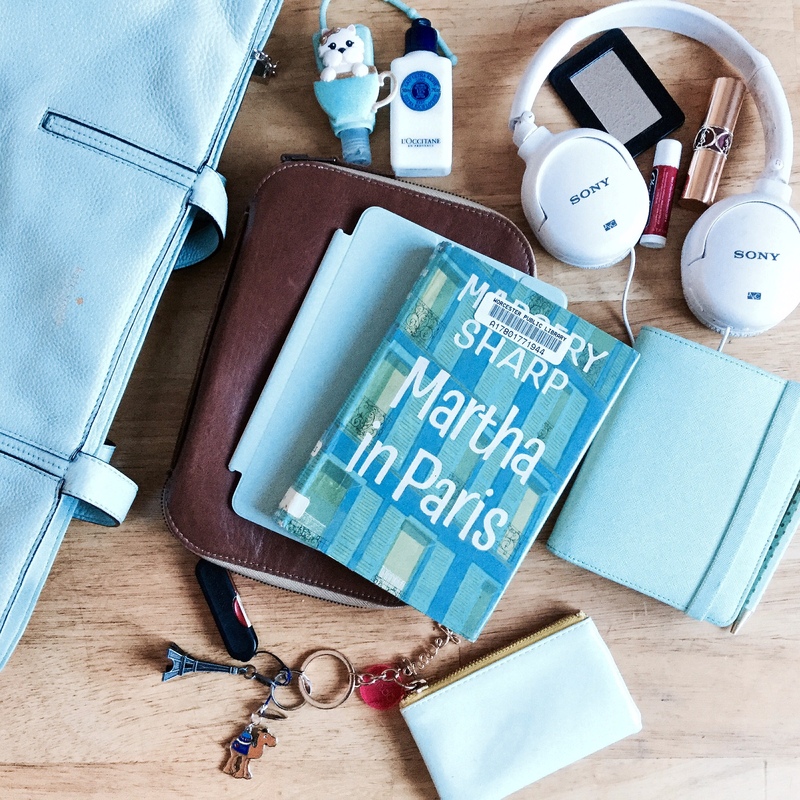 Martha in Paris is the second book in Margery Sharp’s trilogy based on the character of Martha. Find the review for the first book in the series, The Eye of Love here. Main Characters: Martha (an art student), Eric Taylor (an English bank employee in Paris), Eric’s Mother, Madame Dubois(Martha’s guardian in Paris). Martha in Paris picks up the story of Martha nearly a decade after where the The Eye of Love left us. At that juncture, Martha (an orphaned child living with her aunt Dolores) and her artistic talent had been discovered by a rich patron, Mr Joyce, a friend of the family. In the subsequent years Martha’s talent has been nurtured with special art training. Martha in Paris recounts Martha’s student years in Paris. Here, for two years she studies art under the guidance of one of France’s most eminent art instructors. Her tuition and expenses are met by the kind aegis of Mr Joyce, Martha’s wealthy benefactor. Whilst in Paris, Martha meets an Englishman by the name of Eric Taylor. They meet each other regularly under the tromp l’ oeil’ statue of Tragedy and Comedy in Tuileries Garden where Martha sits on the exact same bench everyday to enjoy her half-French loaf stuffed with delicious charcuterie. Eric, hungry for companionship with a fellow English person tries to engage Martha in lively discourse. He mistakes her lack of conversation for reticence, little knowing that Martha would rather shun any kind of interaction whatsoever. After a week of one-sided discourse on Eric’s part, he invites her to dinner to meet his mother on Friday night. Nothing can persuade her to accept his invitation until she hears of the bathroom renovations the Taylor’s have installed in their apartment. Martha in desperate need of a comforting, hot bath quickly changes her mind and accepts Eric’s invitation with great alacrity. “Is the bath vitreous?” asked Martha. “What time on Friday?” asked Martha. Martha arrives at the Taylor’s apartment at the appointed time on Friday, with a mysterious paper packet. Eric mistakes the packet as a thoughtful hostess gift but notices that Martha fails to bestow the gift to Mrs Taylor. Promptly upon arrival Mrs Taylor shows Martha around, based upon the understanding that Martha has a keen interest in viewing the apartment. As soon as they enter the bathroom and Martha has admired the facilities she laments that she has not had a proper hot bath in months! One thing leads to another and before very long, in fact the ten minutes remaining before dinner, Martha decides to take a hot bath much to Mrs Taylor’s astonishment. Despite Martha’s unconventional behaviour, Mrs Taylor tolerates and indeed welcomes Martha’s weekly visits. This is because Mrs Taylor does not find Martha’s appearance or personality intimidating. The weekly Friday visits and baths become a ritual and Martha and Eric find themselves in a situation which is too close for Martha’s comfort. How Martha deals with the resultant circumstances of her relationship with Eric forms the theme of the remainder of this novel. Sharp’s writing is at her wittiest best in this novel. The stolid, determined and somewhat selfish artistic temperament of Martha is fully manipulated to render moments of extreme comedic humour in the novel. Quite disconcertingly, however, Martha’s ‘artistic temperament’ fills us with dismay as we notice a complete absence of love and compassion. I enjoyed the quirky book and the unusual ending made me immediately put in a library requisition for the third book in the trilogy- Martha, Eric and George. This review is for The 1924 Book Club. To discover more about this effort and to read additional reviews of books published in 1924 do visit Simon from Stuck in a Book’s hub post or Karen from Kaggsy’s Bookish Rambling’s hub page. Sometimes he took down Vergil or Xenophon and read for a few moments, but he was soon back again with Doctor Thorndyke or Inspector French. I had noted down Inspector French’s name for my ‘to be read’ list and thought no more of him until I was searching for a suitable book to review for The 1924 Book Club. ‘Inspector French’s Greatest Case’ was published in that year and to my delight I discovered this was the first entrée into the mystery series. Moreover, the book was available at my local library. While I was researching alternative mystery story writers from this period I was surprised to find that the only writers of my acquaintance who were writing at that time were Agatha Christie and Dorothy L. Sayers. Agatha Christie published ‘The Man in the Brown Suit’ in the same year along with ‘Poirot Investigates’. Dorothy L. Sayers had published the first in her Lord Peter Wimsey crime series ‘Whose Body’ in 1923, after which there was a three year hiatus before ‘Clouds of Witness’ was published in 1926. In 1924 neither Margery Allingham (Crime at Black Dudley, 1929), Ngaio Marsh (A Man Lay Dead, 1934), Josephine Tey (The Man in the Queue, 1929) or Edmund Crispin (Case of the Gilded Fly, 1944) had started publishing their work. As a result of this discovery I went into reading this novel with the pre-conceived notion that the writing might be somewhat archaic. Nothing could be further from the truth. Freeman Wills Croft’s writing is surprisingly modern, his language easy to read and his flow of thought fluent and comprehensible. In ‘Inspector French’s Greatest Case‘ we are introduced to a case of murder that occurs at the offices of Duke and Peabody, a diamond merchant located at Hatton Garden in London. On a cold night in the middle of November, the body of an employee, by the name of Mr. Charles Gething is discovered prostrate on the floor in the inner office of Mr. Duke. Mr. Duke’s large Milner safe has been ransacked with the loss of thirty-three thousand pounds worth of diamonds and a thousand pounds in bank notes. Mr. Gething has undoubtedly been murdered as evidenced from the ugly wound made to the back of the skull by a blunt instrument. The theft of the diamonds and money previously secured in the safe are the motive behind the murder. To investigate the case, Inspector French of the Criminal Investigation Department of New Scotland Yard is called in. …The third was a stout man in tweeds, rather under middle height, with a clean shaven, good-humoured face and dark blue eyes, which, though keen, twinkled as if at some perennially fresh private joke. His air was easy-going and leisurely, and he looked the type of man who could enjoy a good dinner and a good smoke room story to follow. Inspector French investigates the circumstantial evidence in a methodical and systematic way. A paper trail led by the stolen bank notes leads him on a wild-goose chase across the beautiful Swiss Alps and later on to Barcelona and Amsterdam. There are a number of false clues and likely suspects. Inspector French leaves no stone unturned in his effort to grasp at the truth. He works tirelessly. We find that he becomes depressed when he has no immediate line of investigation to pursue. Freeman Wills Crofts, the author of the novel worked as a railway engineer before turning to writing detective fiction. This background information surfaces in the plot line. There are many descriptions of train travel in the book. These train journeys and the places Inspector French passes on his travels through Europe are described in great detail and add an extra layer of appeal to the story. We travel with him to Interlaken, along the shores of the Lake of Thun, along the narrow gauge line that passes into the hearts of the giants of the Bernese Oberland; past the towering peaks of the Matterhorn, Eiger, the Mönch and the Jungfrau. The scenery unfolds in our imagination as we follow Wills Croft’s travelogue. Later we scramble across Channel crossing ferries at a moment’s notice along with French and travel the breath and depth of the continent to Havre, to Bordeaux by the Paris-Orleans line, then on the Midi to the Spanish frontier at Irun, and then via Medina and Salamanca to Oporto. Freeman Wills Croft’s fascination for train timetables is evident in the construction of the plot. What do we learn about the personal nature of Inspector French? Has he the calculative obsessive temperament of a Poirot-like detective or does he share the amazing deductive powers of a genius like Sherlock Holmes? The answer is neither. Freeman Wills Croft’s detective Inspector French is the most ordinary of detectives, a hard-working humane person shunning cruel subversive techniques of interrogation in favour of a caring, kindly approach. …He was not only a man of natural kindliness of heart, but he had the gift of imagination. He saw himself in the girl’s place; and was glad he had not added to her trouble. Inspector French’s Greatest Case is not devoid of humour and charming domestic detail. Freeman Wills Croft describes an aspect of French’s home life that made me smile. Whenever Inspector French is perplexed with his case he returns home to his wife and describes in great detail aspects of the case that are troubling him. The poor lady, prevented from tacking the household chore she was engaged in is forced to take up her sewing and sit on the large Chesterfield armchair while French recounts the evidence. Usually Mrs. French ‘took a notion’ or asked unusual questions that shed light on the case in a different way. We do not get to know very much more about Inspector French’s personal life in this book. We do learn that he has lost a son in the Great War but he appears to be intensely private about this tragedy. 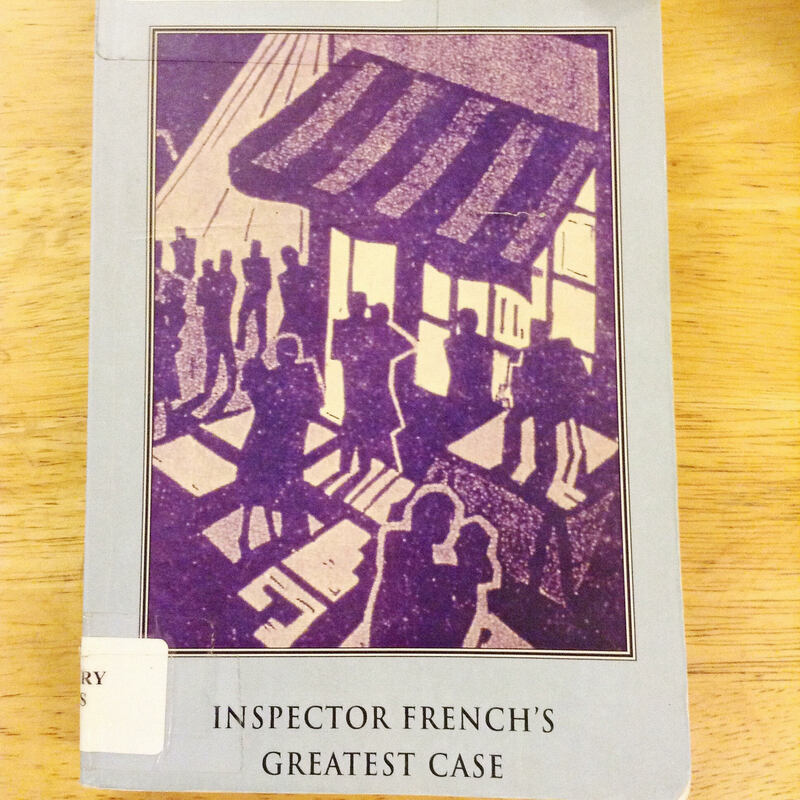 Inspector French’s Greatest Case is a fantastic first novel in a series. I am curious to learn more about Inspector French, his dogged determination and his persistence. Freeman Wills Crofts has provided us with a refreshing ‘new detective’ (at least new to me). He delivers a carefully grafted, meticulously detailed plot. At every stage of the investigation we are privy to French’s thoughts and ideas so we do not feel cheated or left out. In the finale we are treated to a delightful twist in the plot which is done quite masterfully. A big thank you to Simon for encouraging me to read a wonderful book from 1924.